High Speed Technologies Repairs and Rebuilds GMN Spindles. HST is one of the oldest independent spindle repair facilities. Each senior technician has over 15 years of experience. Call us today to talk about your spindle repair questions, 1-603-483-0333. This high speed, high frequency GMN Spindle came in with failed bearings. The shaft rotated but the bearings sounded very loud and rough. It was disassembled, thoroughly cleaned and the problem was diagnosed. The shafts pilot face had excessive runout and required a Kiss Grind only. The front bearings were actually well lubricated and operable but well worn. It was a different story however with the rear bearing pair. Both bearings had failed catastrophically. You’ll notice in the picture below how the ball cage within the bearing #4 split down the middle and basically crumbled. There were no signs of abuse or a lack of lubrication. In the end, after thoroughly examining the spindle and speaking with the customer, it was determined that these bearings failed due to normal wear and tear over a long period of time. 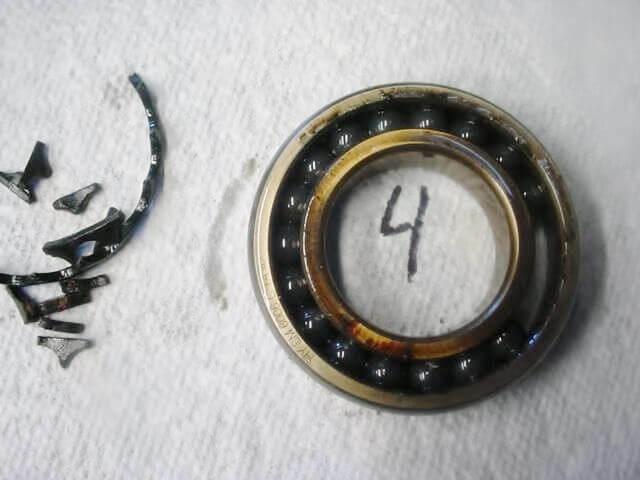 These bearings were replaced in kind with name brand super precision ABEC 7 bearings. GMN Spindle Rear bearing failure. After the GMN spindle repair is complete it must pass exhaustive testing. 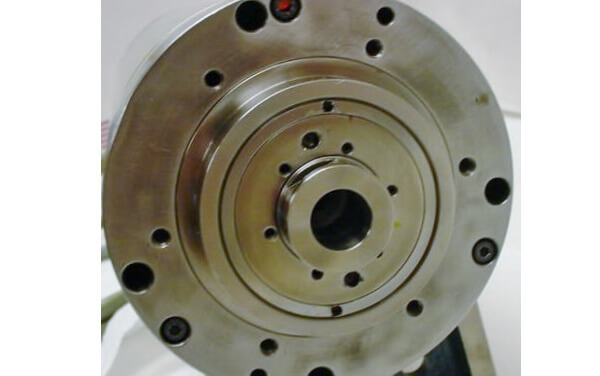 Run-out, coolant flow, pressure and vibration are some of the test that your spindle must pass before we ship it. At HST every detail counts with your spindle repair. Call today 1-603-483-0333.